I have had such a lovely morning with my Aunty. 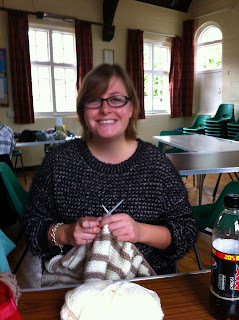 Aunty K took me to a knitting get together in a little church in Frating where many of Colchester's knitters and crocheters turned up with a huge variety of projects on their needles. And cake. One lady sat next to me who was crocheting poppies for World War One's 100th anniversary so quickly that piles of them were produced in an alarmingly short amount of time. While she was there the lady purchased yet another ball of red yarn to continue to support the cause she believes in. I am such a selfish knitter. It was so nice to catch up with Aunty K as I haven't managed to make the weekly knitting group for a while. We talked about podcasts and audio books and food and our personal caffeine preferences - Pepsi Max for me, Diet coke for her. We chatted about socks and yarn and food again. We expressed our excitement for next weekend's visit to Ally Pally. Then we decided that it was way passed lunch time and headed home. Left over spaghetti cheese is heating up in the oven and I will spend the rest of the afternoon knitting. The lads will come over later and we will watch the football and have a roast (chicken and The Gentle Giant is cooking). Lovely.